Finally what I have been waiting for since school started is The Pumpkin Spice Latte . 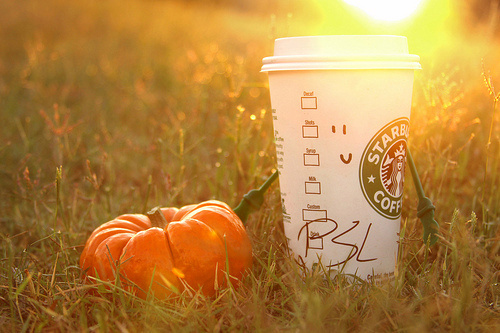 Working at Starbucks has it perks and when the PSL is release you know its fall. Its one step to many of the fall obsession coming back. I know technically fall is until September 22 but I am ready for it. I love to drink my Pumpkin Spice hot or as a frappuccino with a shot of espresso with coconut milk. And I am also ready for my all time favorite The Salted Caramel Mocha. I ready for the cold weather and the leaves changing. I am ready for sweater weather and to wear my combat boots and leggings. I am still working on my fall bucket list but when I have it done I will post it.